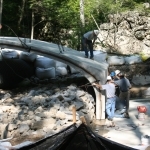 The Project involved the removal of an undersized Red Listed bridge and installation of a new precast arch span bridge. 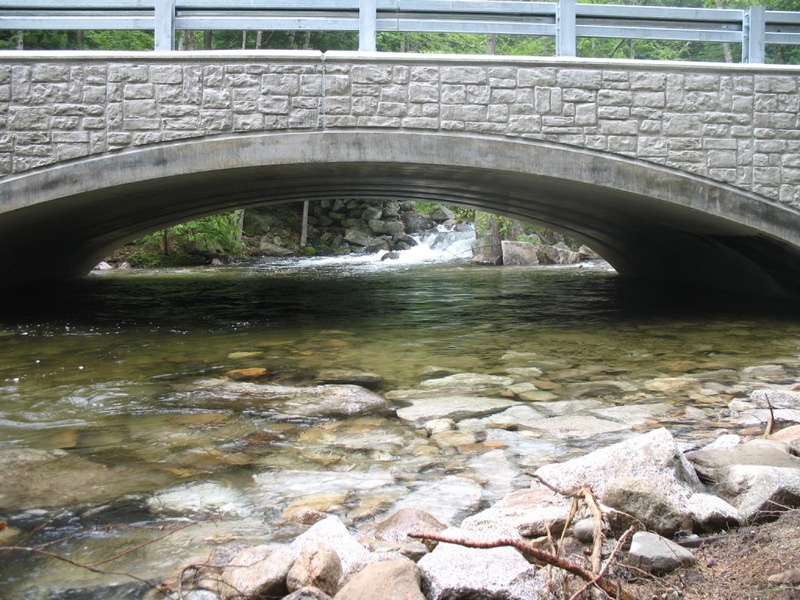 The existing bridge was only capable of handling 3 ton loads and unable to handle potential heavy water flows. 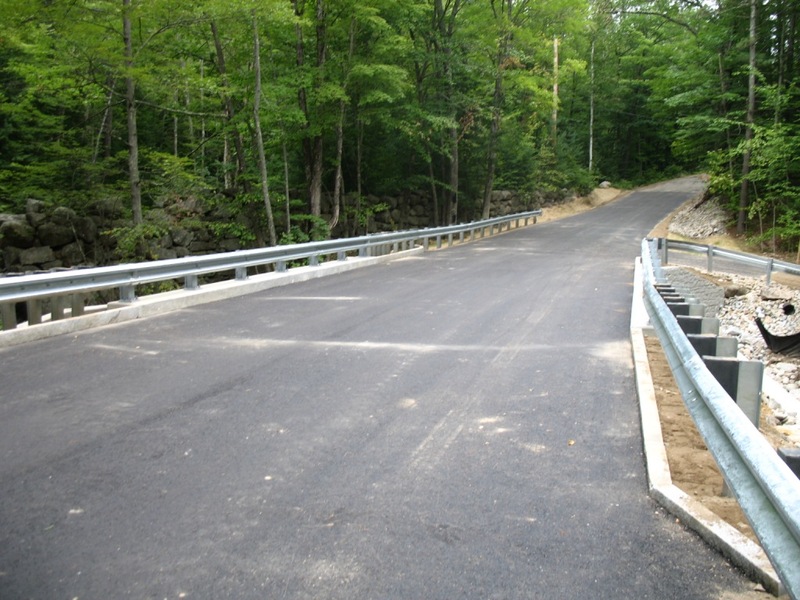 The new bridge was designed to be capable of handling 72 ton loads and ample space for handling heavy flood flows. 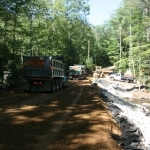 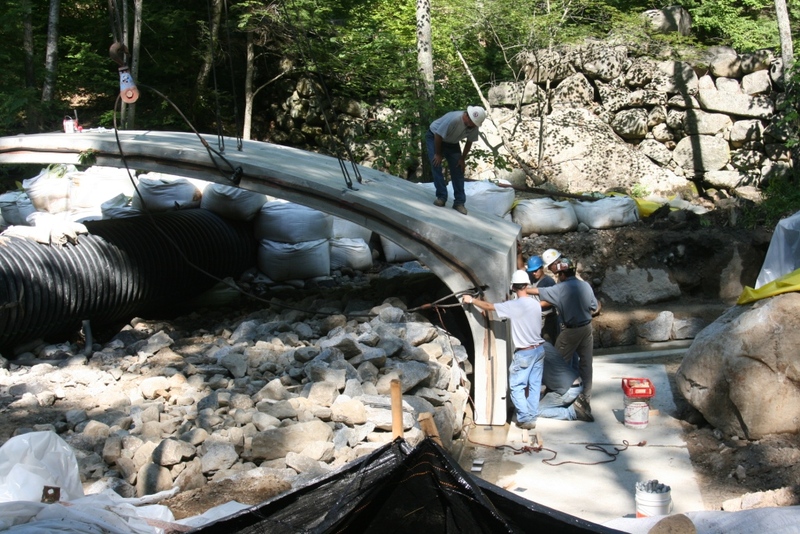 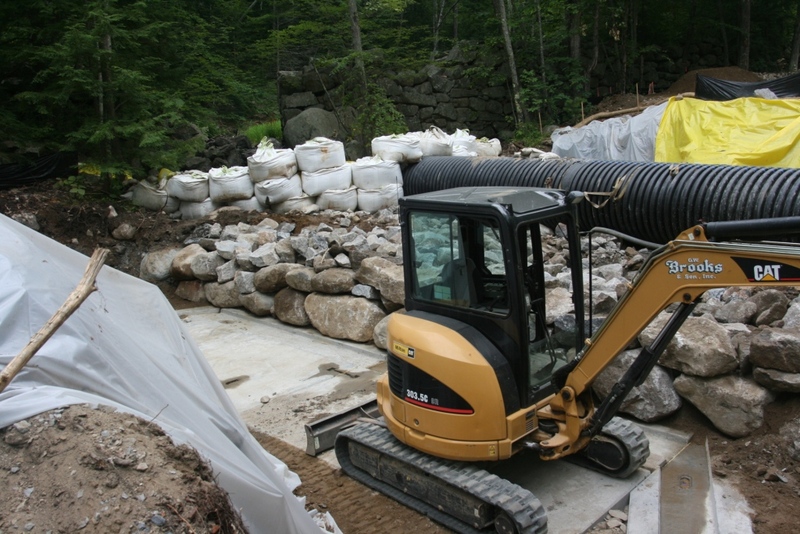 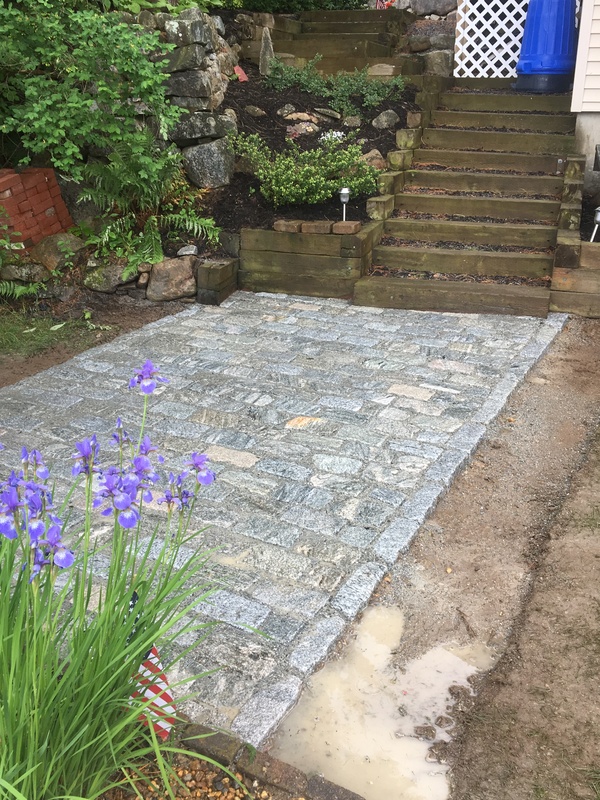 Throughout the project care was necessary while working next to a historic dam. 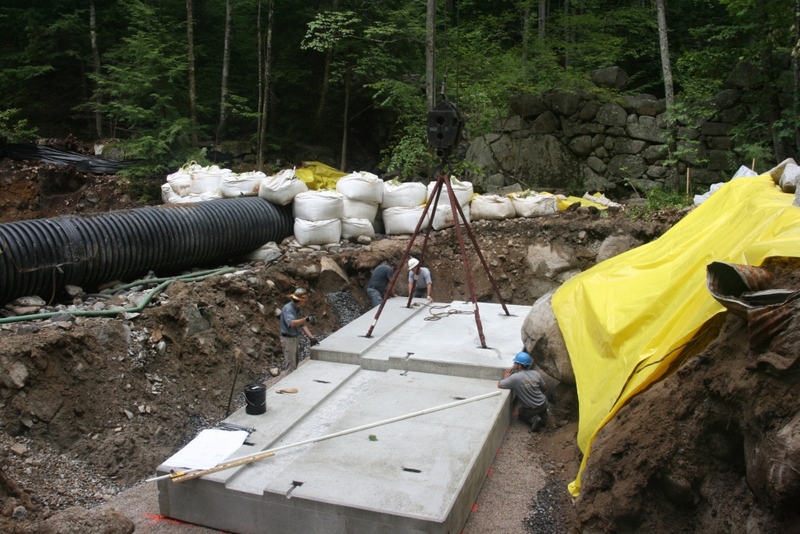 Unique to this project were several springs that complicated excavation for the new bridge and bridge approaches. 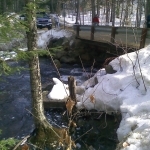 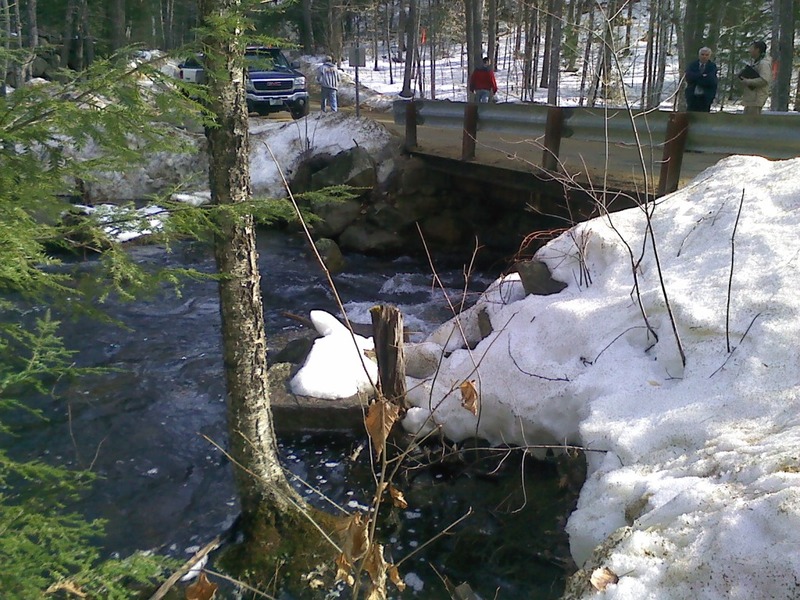 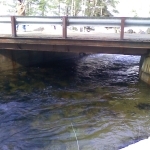 The existing bridge was on the State of New Hampshire Red List. 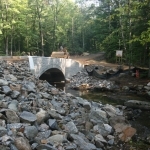 To bring the bridge off of the Red List required complete reconstruction. 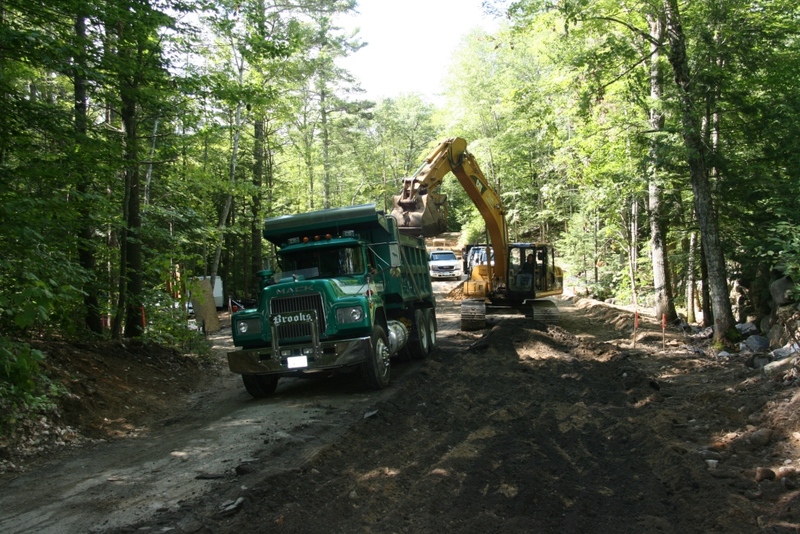 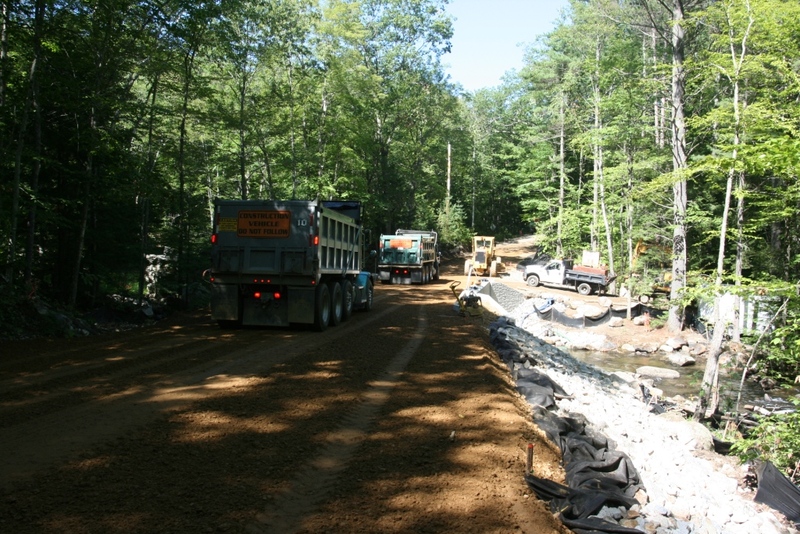 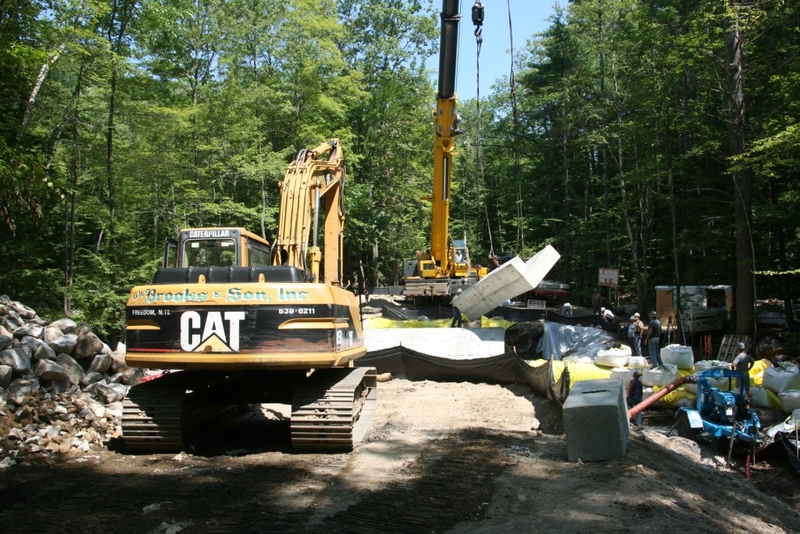 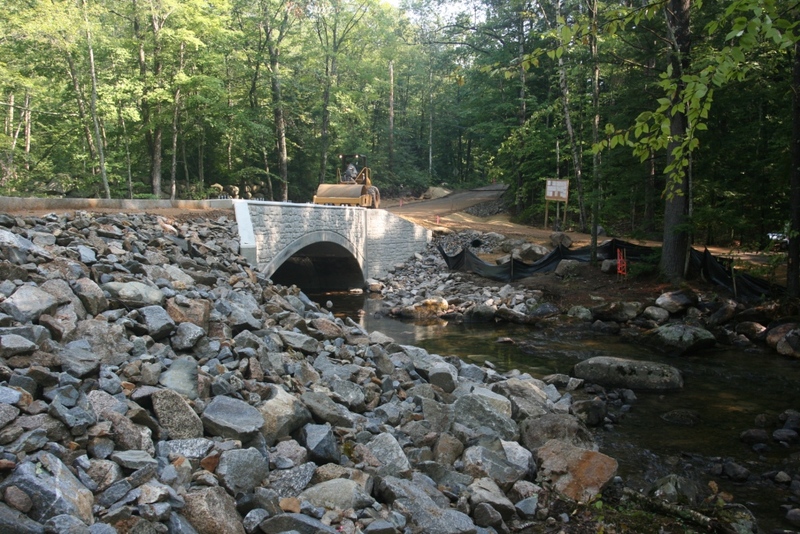 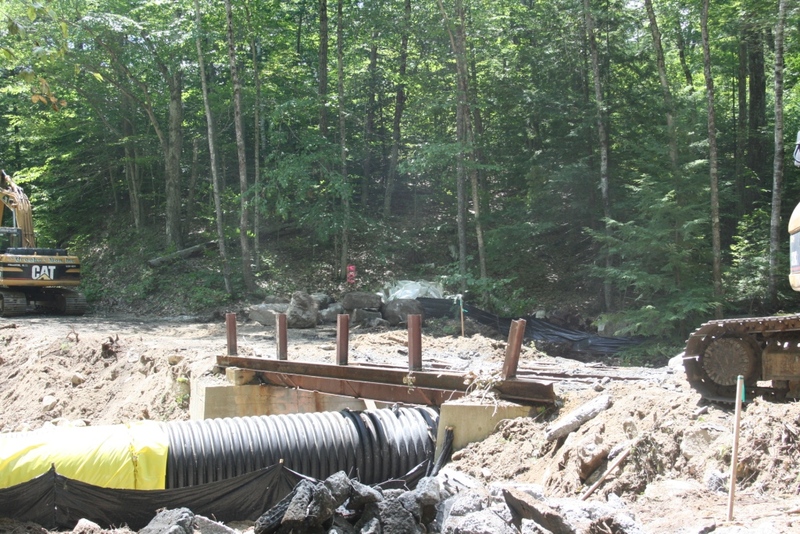 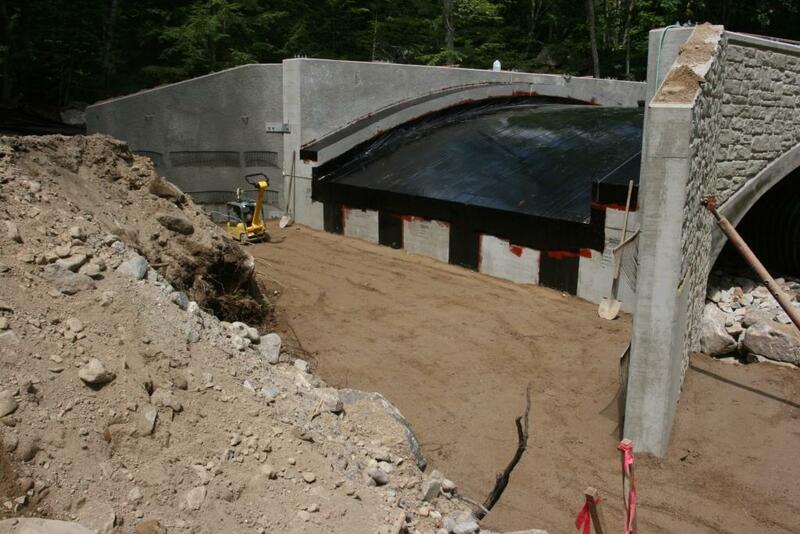 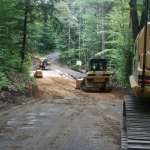 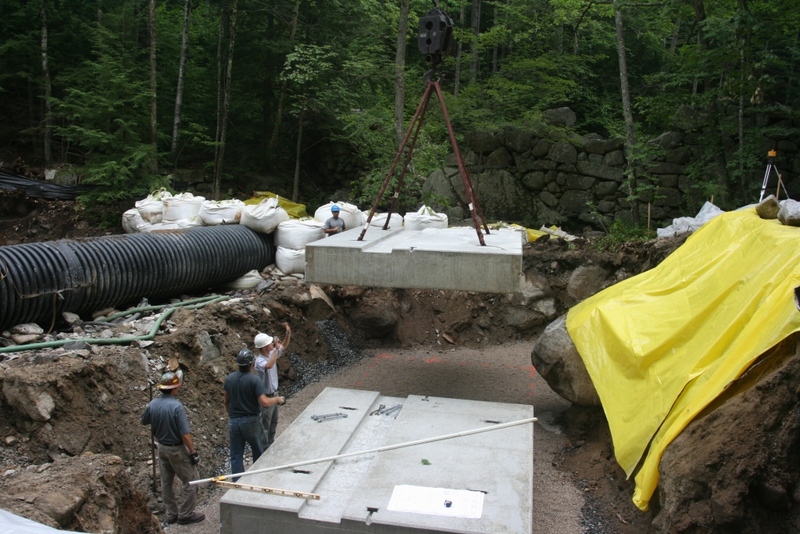 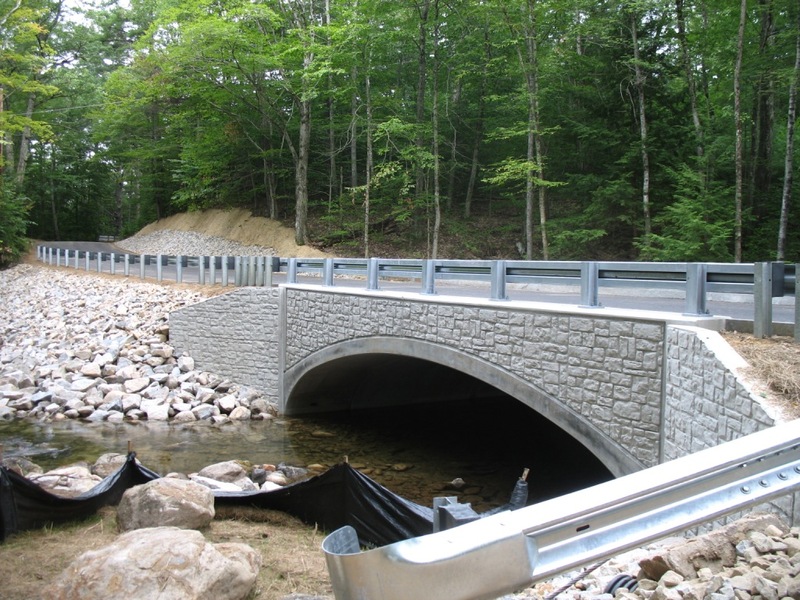 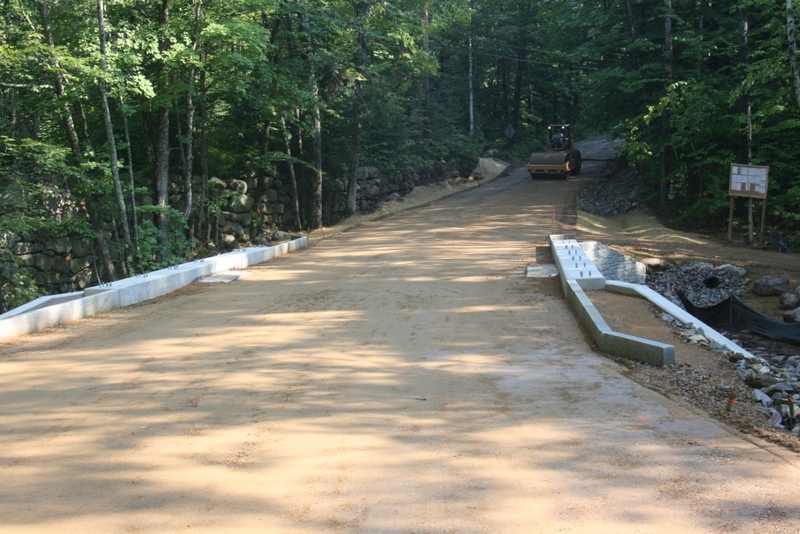 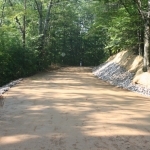 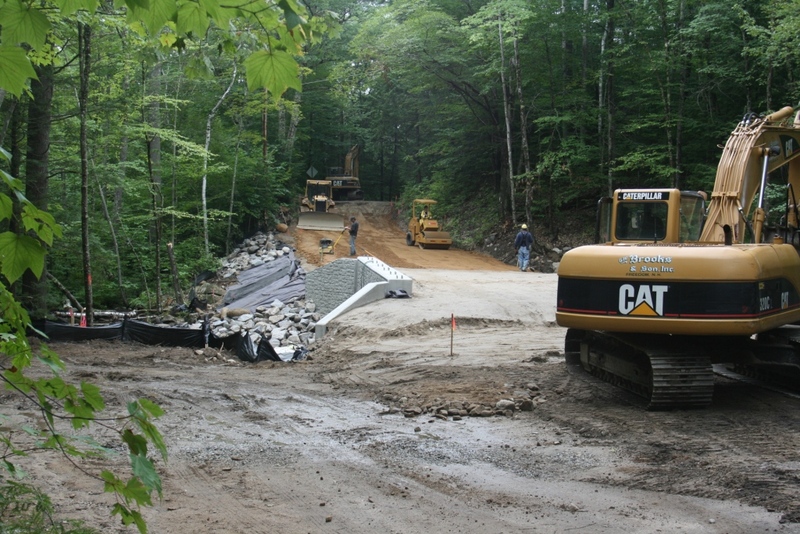 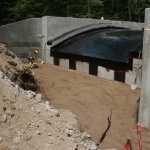 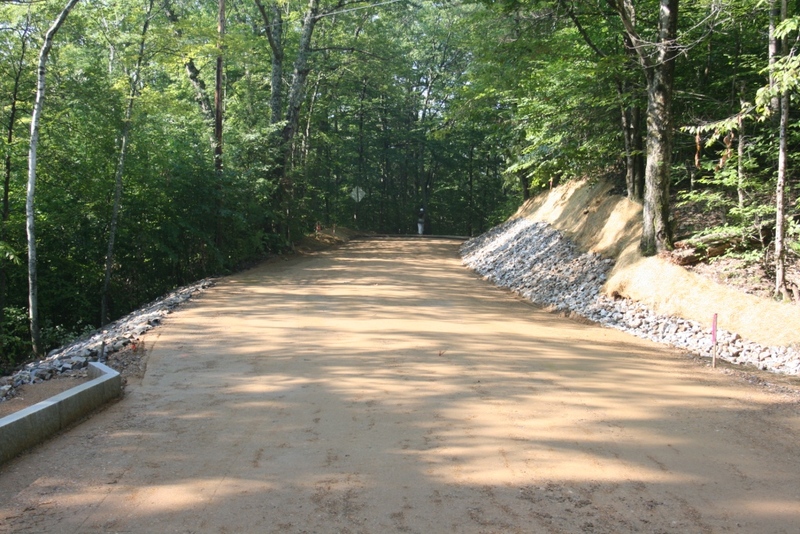 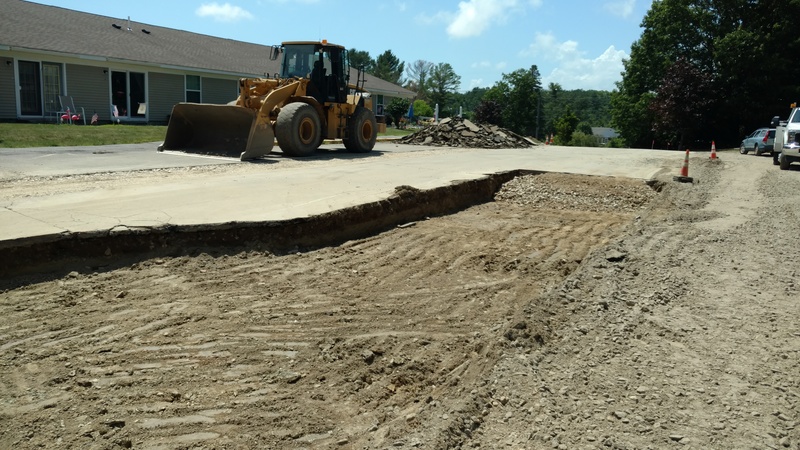 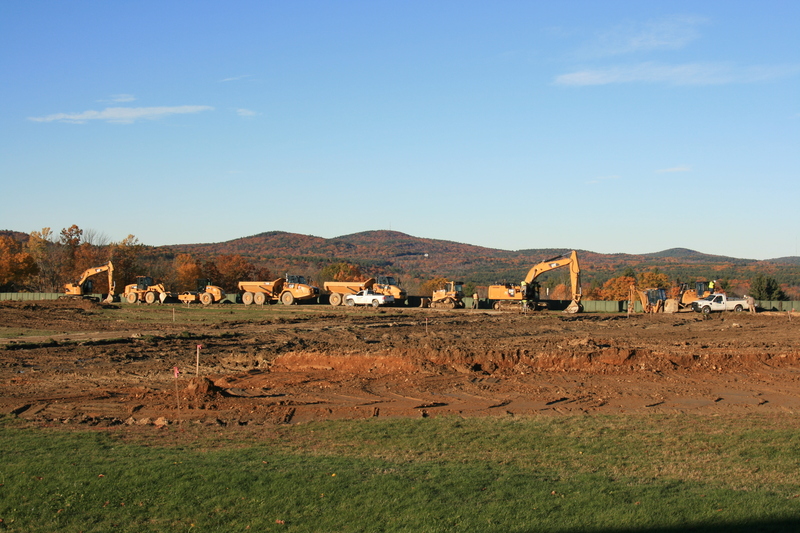 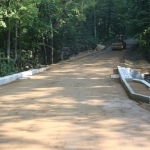 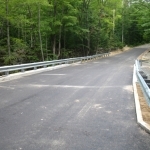 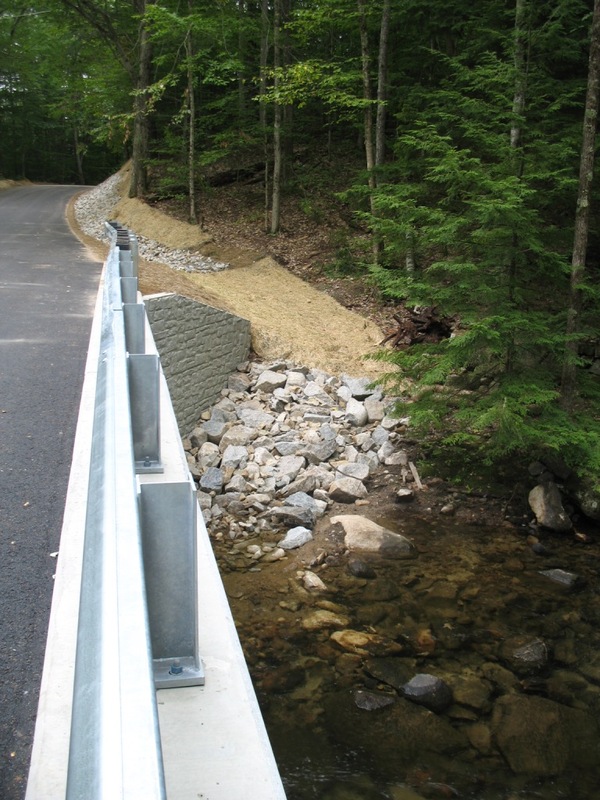 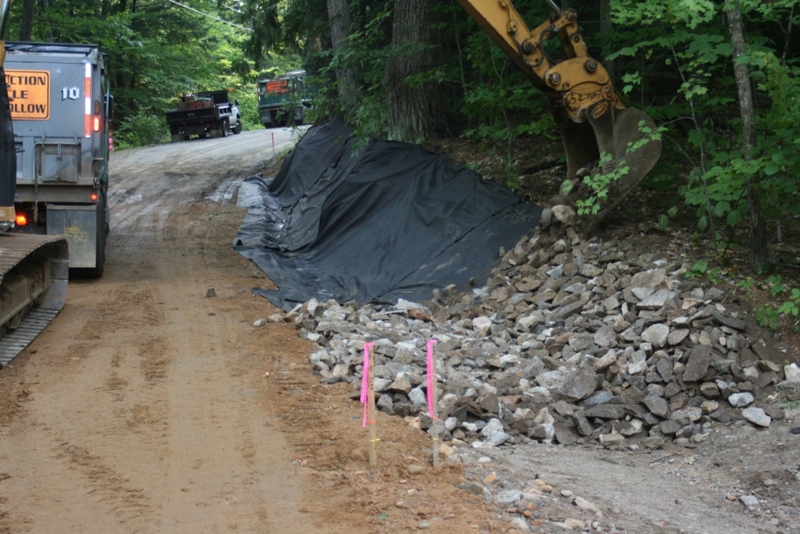 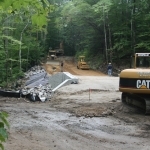 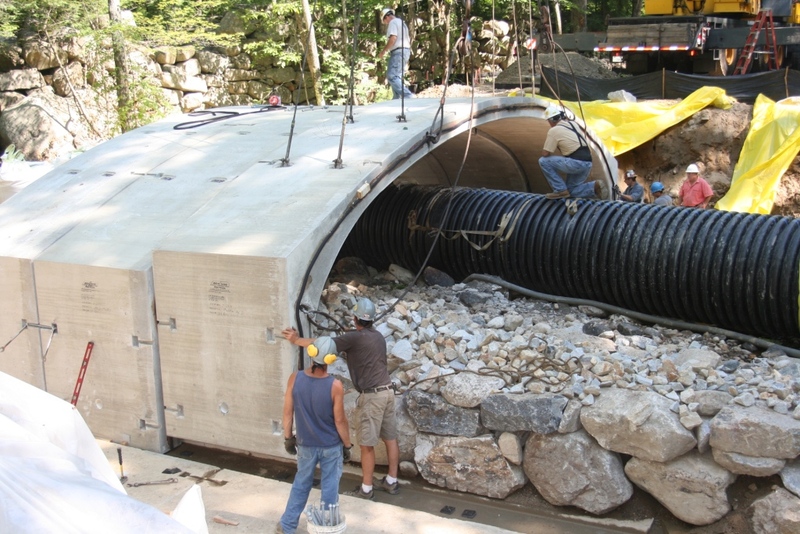 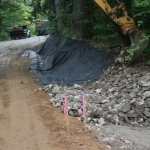 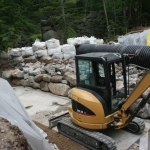 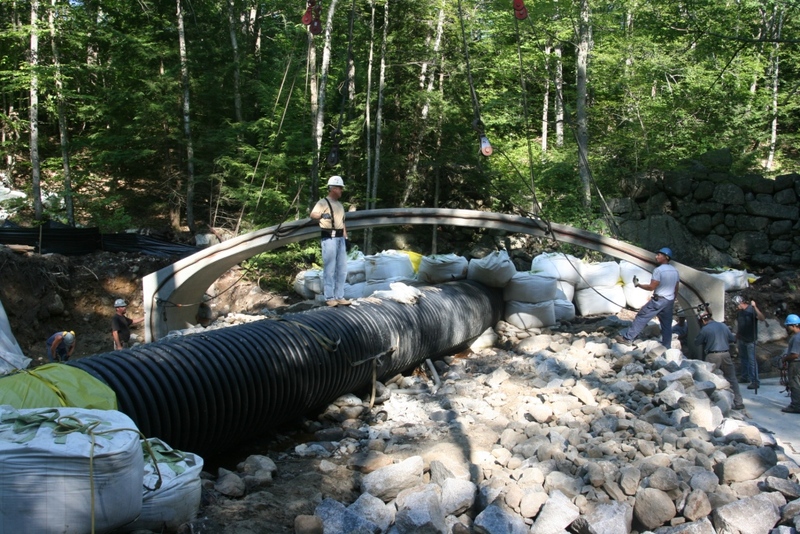 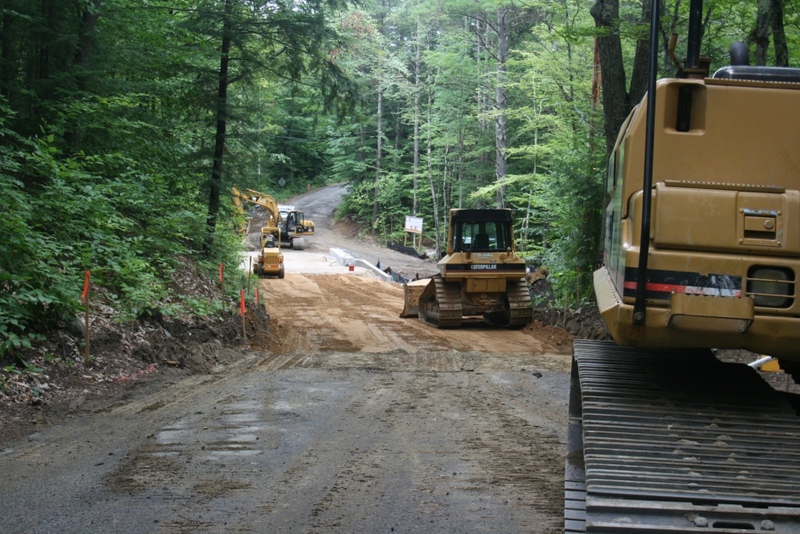 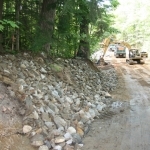 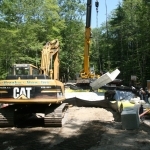 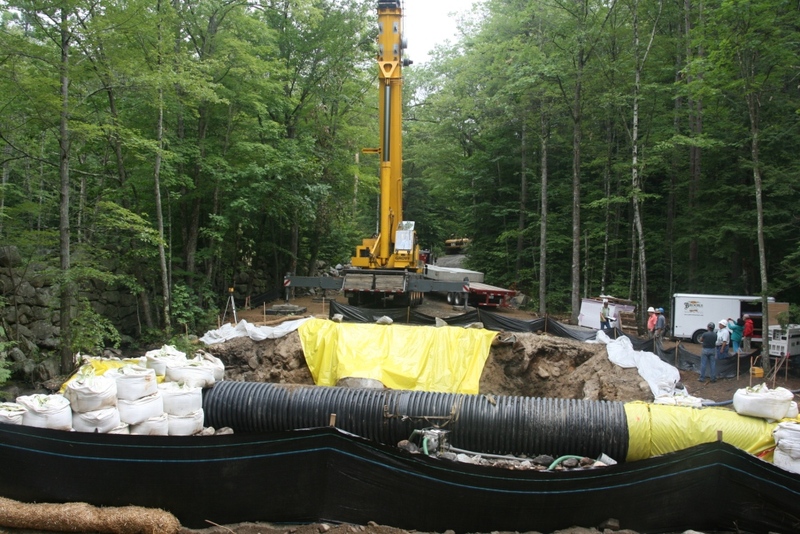 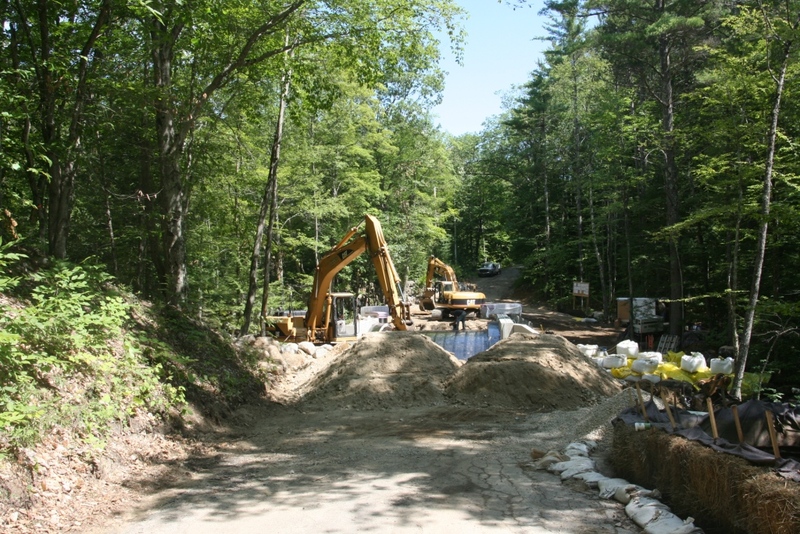 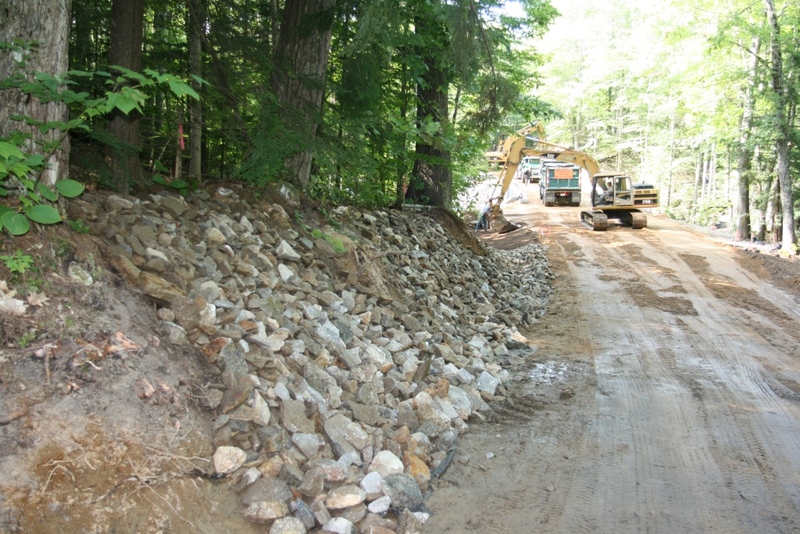 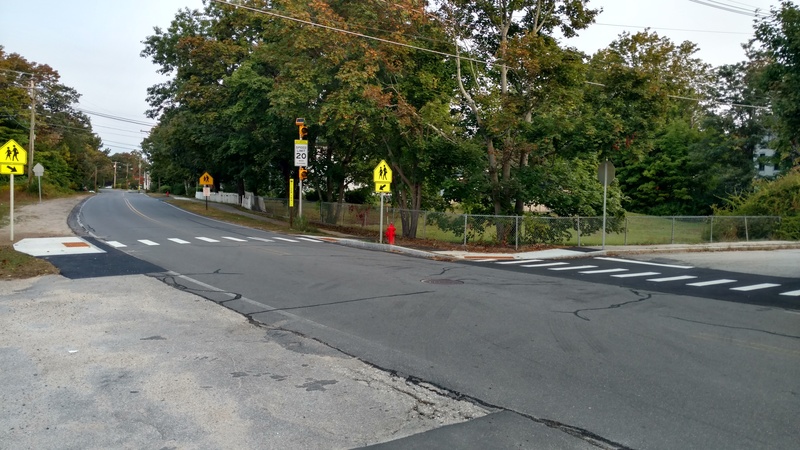 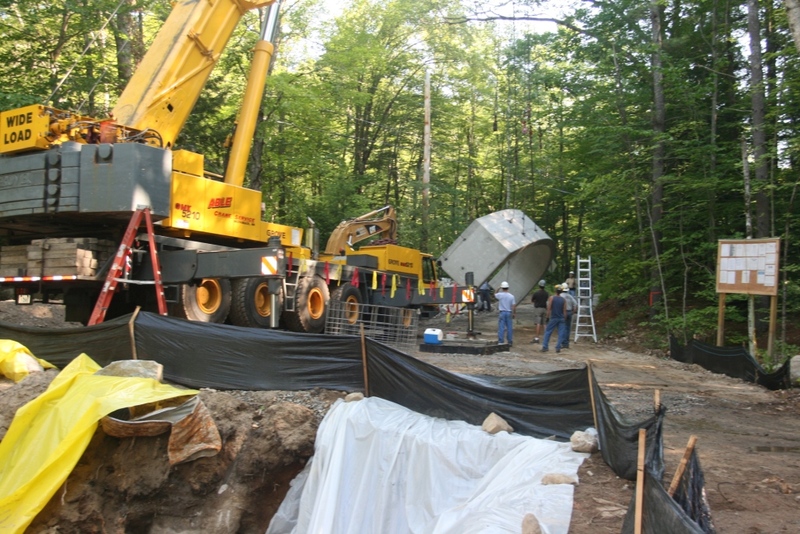 The project was 80% funded by the NH DOT through the state Bridge Aid Program. 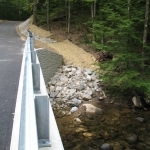 The existing bridge had previously been repaired with stop gap measures to extend the life of the steel beam structure. 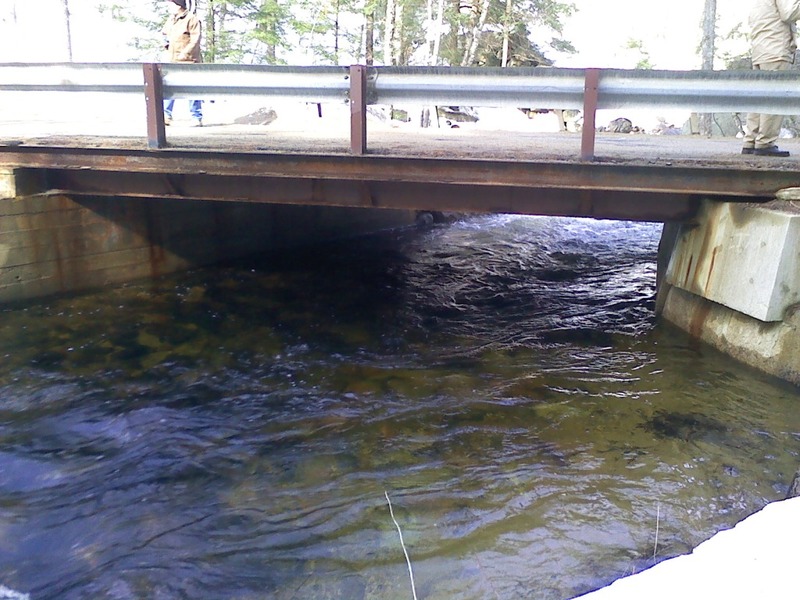 Issue: Weight limits for the bridge posed a potential issue for public safety. 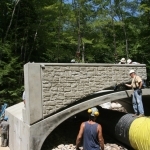 Solution: With the new precast arch structure there is no need for weight posting any longer. 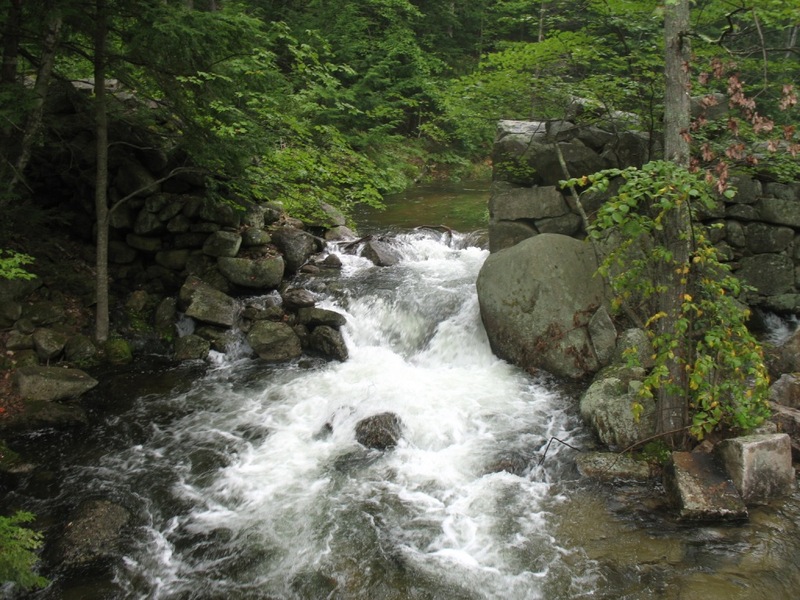 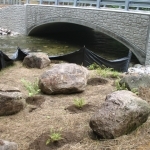 Solution: The new bridge using a natural stone bottom and enlarged interior dimensions should provide for a safe buffer in the event of extreme water flows. 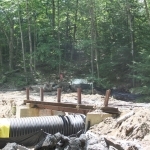 Issue: A historic dam is adjacent to the bridge site which must not be disturbed. 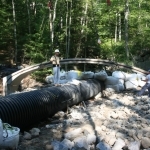 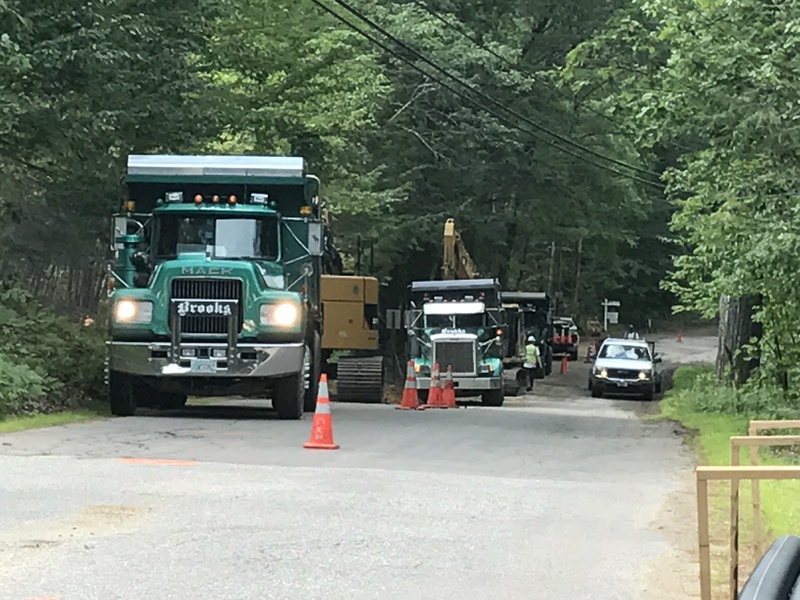 Solution: The crews worked diligently to limit work near the dam and in the end there was no disturbance made to the dam. 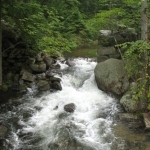 Issue: Aesthetics were extremely important to the abutters. 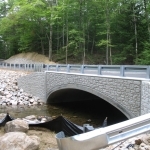 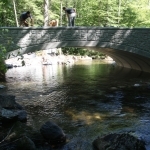 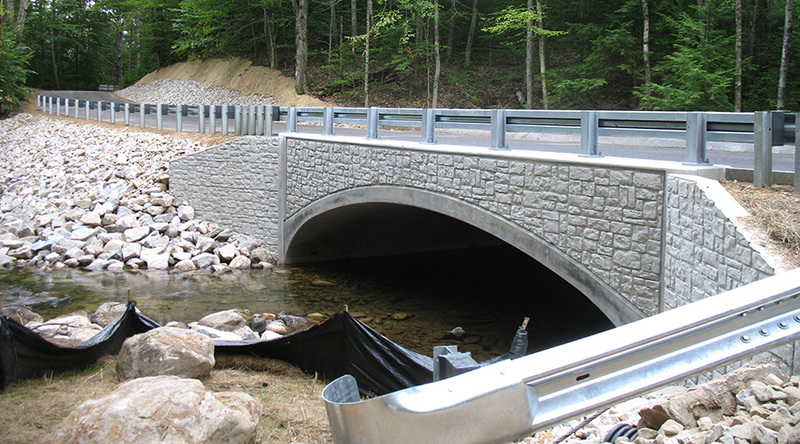 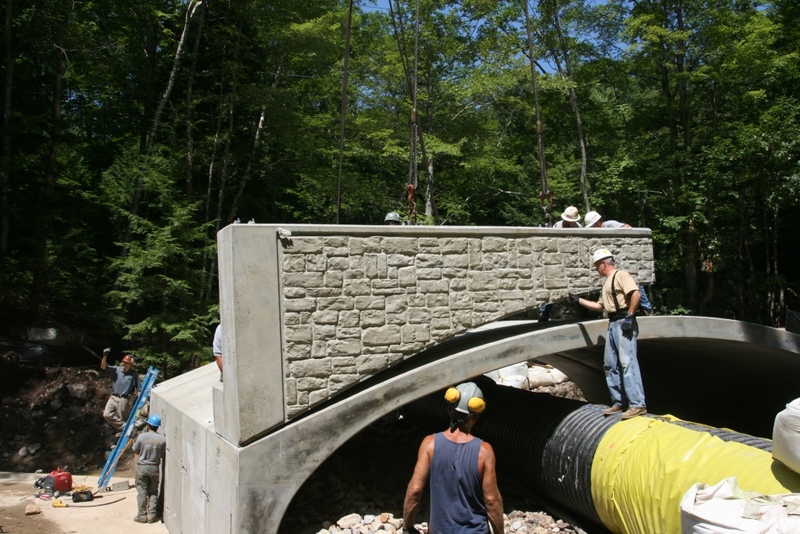 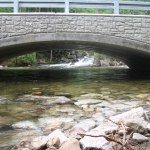 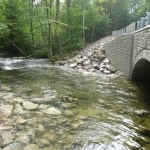 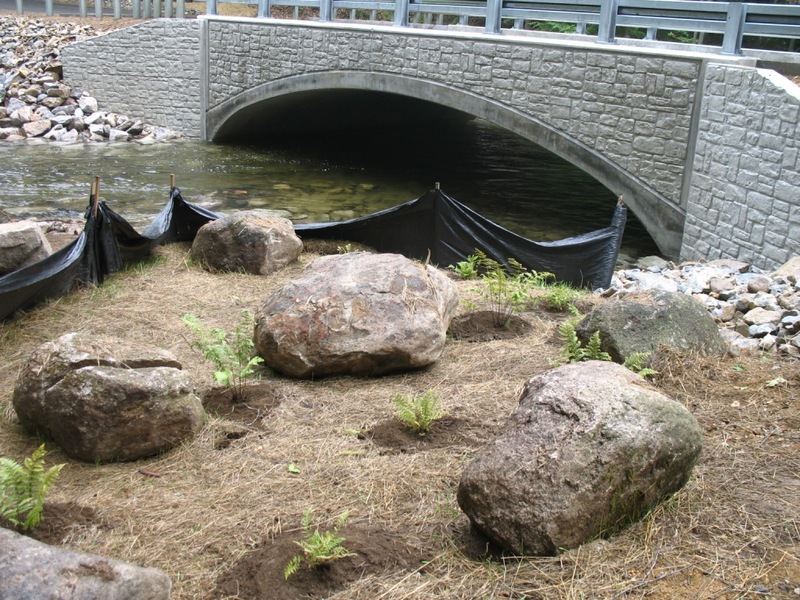 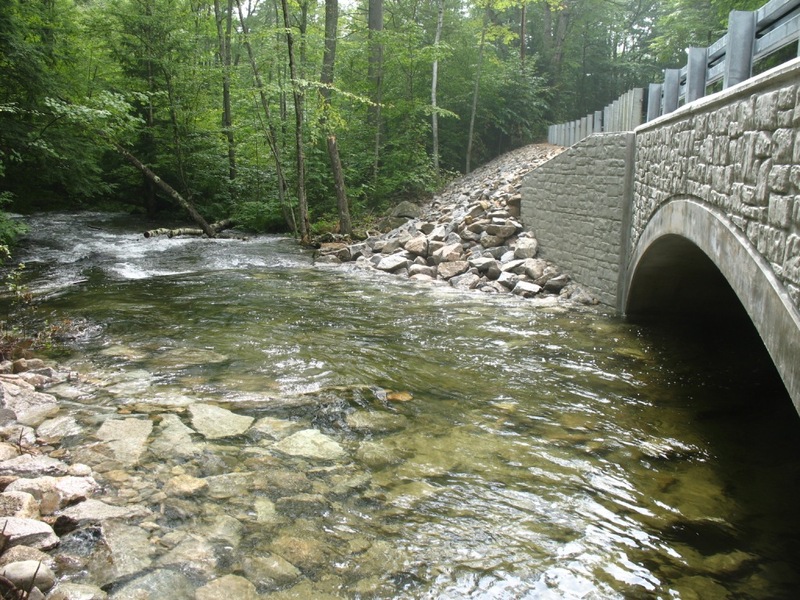 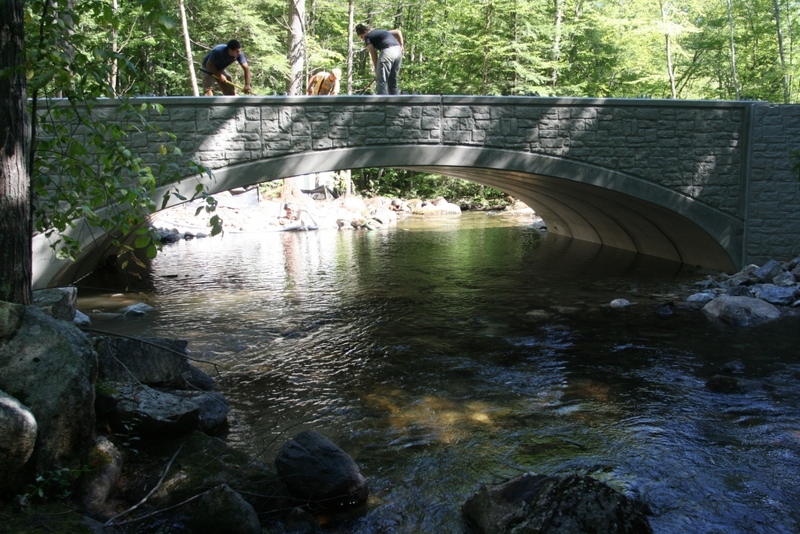 Solution: The new precast bridge has a synthesized ashlar stone finish to help it to blend with the rural environment.